I already reviewed this pack of ramen almost 2 years ago, but I figured it was time to revisit this popular ramen made by Nissin Demae. It doesn't look like the packaging has changed at all in the past two years, which doesn't surprise me since this is exactly how I remember these packets from my childhood. Nissin Demae has achieved a lot of success in the United States, mostly due to excellent distribution, conservative flavors, and marketing. When I tasted the broth, it was a little more complex than I had remembered. 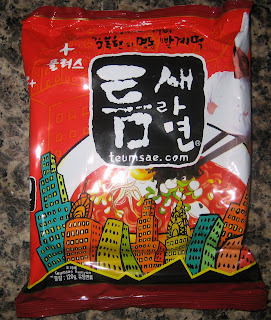 The flavor is predominantly beef, but there are also some spices to liven up the broth. It actually reminded me a bit of Pho due to its complicated identity. 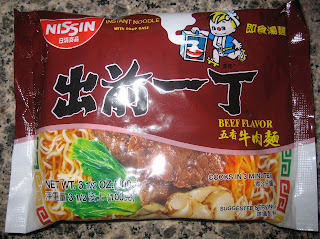 I don't know if Nissin Demae has altered its recipe, but I thought the broth was quite good. The noodles are exactly as I expected from eating packets of Nissin Demae noodles in the past. 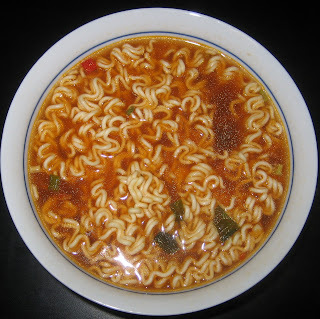 I consider them to be typical instant noodles, fairly flavorless with a slight nuttiness and springy crunch. But the main overall flavor comes from the broth and the broth is quite good here. 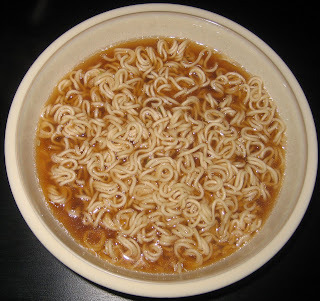 Interestingly, the color of the broth looks much lighter in this picture than in my picture from two years ago, so perhaps the folks at Nissin Demae have altered their recipe and improved the flavor of the broth.